QuickBooksÂ® Online Certification is a pillar of the free ProAdvisorÂ® Program and empowers accounting professionals to confidently advise small businesses, demonstrate their expertise and connect with new clients. Last year, more than 30,000 QuickBooks Online ProAdvisors got certified and shared how beneficial the training and certification bolstered their confidence to help their clients and practices prosper. Weâve also heard from you, our valued partners, about ways we can make the program even better. We know your time is at a premium, that you want flexibility in how and when you learn, and your desire to stay on top of whatâs new in QuickBooks Online as key priorities. Common re-certification date: July 31 annually. Maintain your Quickbooks ProAdvisor benefits. Â Weâve introduced significant changes to our program designed to simplify the process to keep your certification updated every year. Based on positive feedback from our ProAdvisors since rolling out the common renewal date and new exam experience in March 2018, we are extending the same process to the QuickBooks Online Advanced Re-certification. You told us you wanted more meaningful training to drive even greater confidence using QuickBooks Online. The new re-certification training was updated to be more situational and scenario-based to provide better learning, while also helping you prepare for the certification exam. One of the changes we made to QuickBooks Online Certification was initiating a common certification renewal date of July 31 for all ProAdvisors. This change has been well received by our ProAdvisors as the annual renewal date, making it easy to plan for and manage their time efficiently. As a result, we are extending this common re-certification date of July 31 for the QuickBooks Online Advanced Re-certification as well. 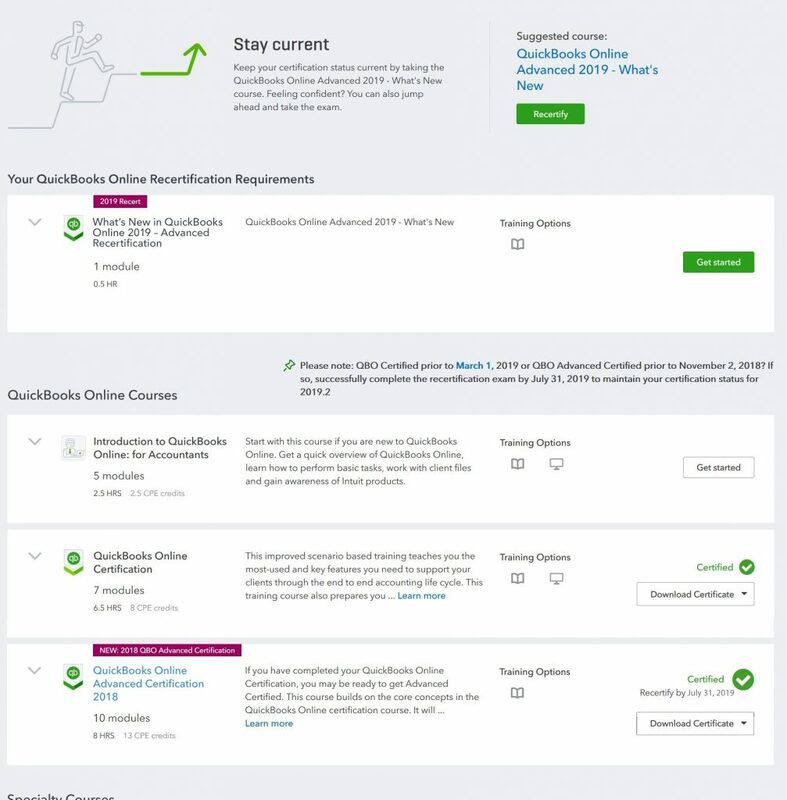 NOTE: You only need to pass the QuickBooks Online Advanced re-certification exam, to maintain both your QuickBooks Online and Advanced Certification status for another year. Intuit spent the past year actively seeking feedback from ProAdvisors via one-on-one interviews, surveys, focus groups and in-person events to learn how the program can help you face the challenges of todayâs ever-changing global accounting landscape. The redesigned program is a result of your feedback and input in an effort to be a better partner to you and create a program that furthers your success and growth. Now, there are more ways to move up the tiers, and unlock new and better benefits. The program was recently updated to a points structure that recognizes more of the work you already do. Instead of just counting QuickBooks Online clients and certification to move up the tiers, youâll now be able to maintain your 100 points once youâve passed your re-certification exam by July 31.